In 1849 Moggill Road formed a boundary with the present day suburb of Chapel Hill. In 1866 Johannes Breddin arrived from Germany. A son, Caesar, was born and the family settled on the banks of Cubberla Creek on a dairy farm. The Breddin name is commemorated in Breddin Street. In 1925 the Moggill Shire, with offices in Kenmore, was disbanded when the suburbs of Chapel Hill, Upper Brookfield, Gold Creek, Pullenvale, Moggill, Fig Tree Pocket, Kenmore and Brookfield became part of the Greater Brisbane Council. Chapel Hill really began to develop in the 1950s and 1960s when closer subdivision occurred. The name for this suburb draws attention to the existence of the people called Methodists. Back in 1873 one of the Methodist Churches which later united to form the Methodist Church of Australasia, the Primitive Methodist Church, bought land and in the next year built a chapel on the hill in such a prominent position that it became a landmark for people travelling out along Moggill Road. The area gained its name from this chapel on the hill. Sadly this story of the name may be wrong and that the area may have been named after Chapel Hill in England. 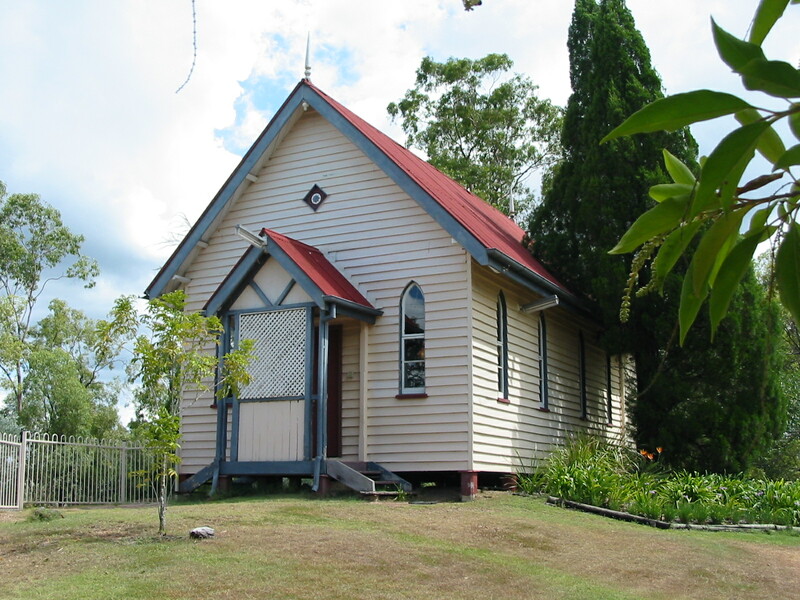 In 1875, Primitive methodist chapel built on the hill in Moggill Rd (later Chapel Hill). The Uniting Church in Chapel Hill has a small graveyard with the names of some of the earlier residents of the area. The first church was built in 1873 on five acres of land by the Trustees of the Primitive Methodist Church. The name for the suburb derives from the location of this chapel. The current church was built in 1955. Chapel Hill Uniting Church is located on the corner of Chapel Hill Road and Moggill Road at Chapel Hill, in the western suburbs of Brisbane, Queensland. On this site, in addition to the current worship centre, you will find the original church, built around 1875 as a Primitive Methodist Church, and the associated cemetery, which is now closed. Reference:TELL THE NEXT GENERATION a Project of the Kenmore Uniting Church Parish : Authors HENRY CLARKSON & DAWN LANGFORD. We have photographed and transcribed the inscriptions of the headstones in the small cemetery. THE 18th in a series on Brisbane suburbs. The Making of Brisbane, a series by KEN BLANCH, highlights the unusual in the early days, and is an important chronicle of the city's history. THE church that gave the Brisbane suburb of Chapel Hill its name was built on land bought in 1873 for $7.50. It was built by the trustees of the Primitive Methodist Church, and its graveyard later bore the names of many district pioneers. The original church was replaced with a modern building in 1955, and since then Chapel Hill has become a thriving modern suburb. Aboriginals were plentiful in the area in the early days of Brisbane's settlement. They camped around Mount Cooth-tha, and ranged over hunting grounds that include today's Chapel Hill. Johannes Breddin arrived in the colony from Hamburg on the ship Godsprey and settled at Oxiey in 1866. His son, Caesar, was the first white child born on the western side of Brisbane, and another son, Carl. born in 1875, was the first child baptised in the new church near the banks of Cubberia Creek, to which the family had moved. Carl later went with the family to pioneer the Brookfield area in 1912, but Caesar stayed in Chapel Hill. A small thoroughfare, Breddin Street, commemorates the family. Other early families at Chapel Hill were the Russells remembered by Russell Street and the Bielbys. The Patterson family established a sawmill in Cedarleigh Road before the turn of the century to cut logs brought from surrounding districts by bullock teams. The Moordale shopping centre is named after the Moore family who had a dairy farm on the site. The adjacent suburb of Kenmore, 65 years ago, consisted of a large homestead, a hall, slaughter yards, a small shop, and a track leading to Brisbane. Early families in the area were the Harrises, Stocks, Butlers, Waldens, Penhalifions, Hobsons, Kcllys, Stedmans, Keats, and Tuckets. The railway at Indooroopilly was 5 km away, but there was a racecourse at Moggill Creek flat, where country-style race meetings were held. The name Kenmore is said to have been anglicised from an Aboriginal word for the area to which they used to take their sick to recuperate. Subdivisions in the late 1950s saw Kenmore boom as a high-class residential area. The suburb is now closely settled, although many of its major houses are on acreage blocks, secured early in the land rush. The suburb of Moggill, which extends towards the Brisbane River from Kenmore, takes its name from an Aboriginal word meaning "healthy place". Neighbouring suburbs of Fig Tree Pocket, Indooroopilly and Kenmore.